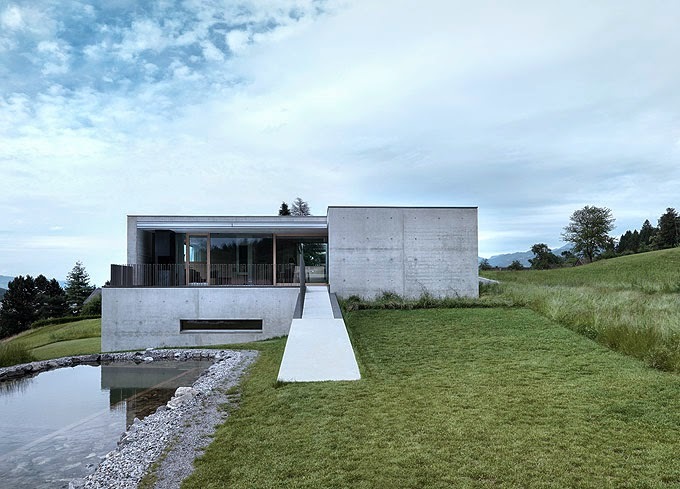 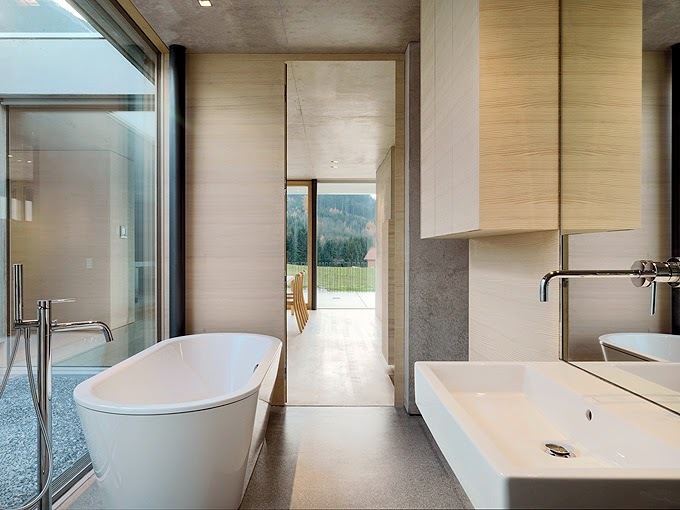 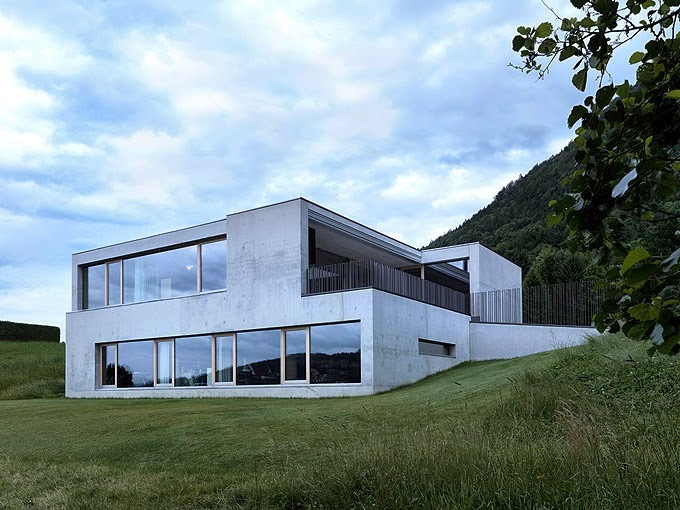 This concrete house, designed by marte.marte Architekten is located in Feldkirch, Austria. 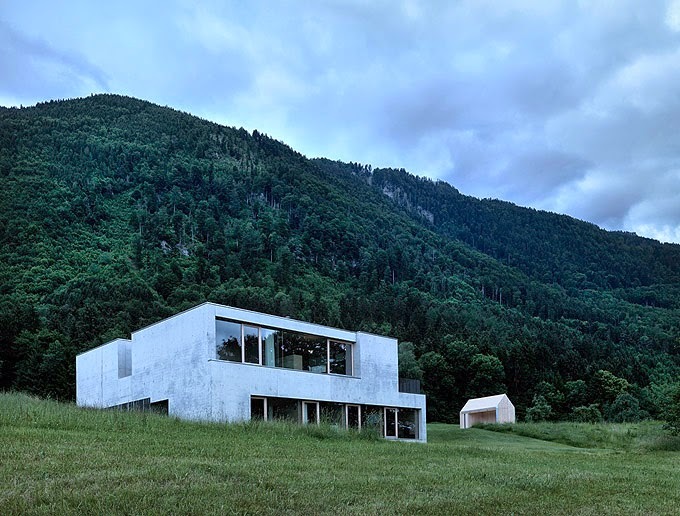 The monolithic volume of the house opens to the valley through extensive glazing that reveals the scenery and mountain panorama. 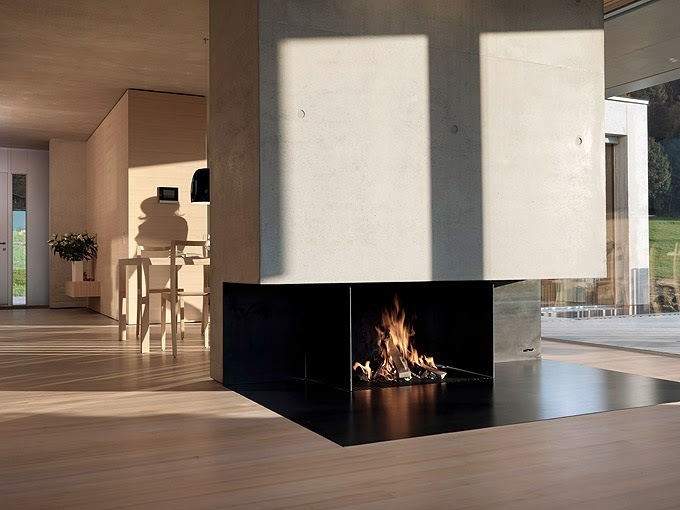 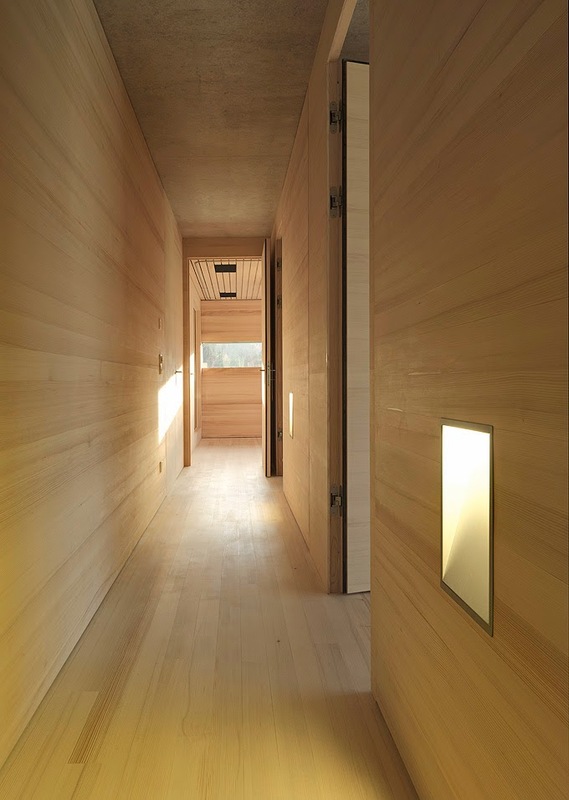 The minimalist interior, covered in the softness of white pine contrasts with the smooth exposed concrete exterior. 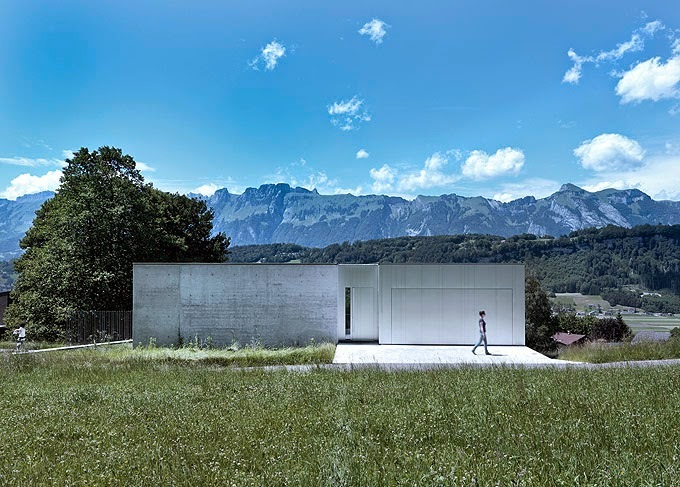 Approaching the house, it seems monolithic, almost hermetic. 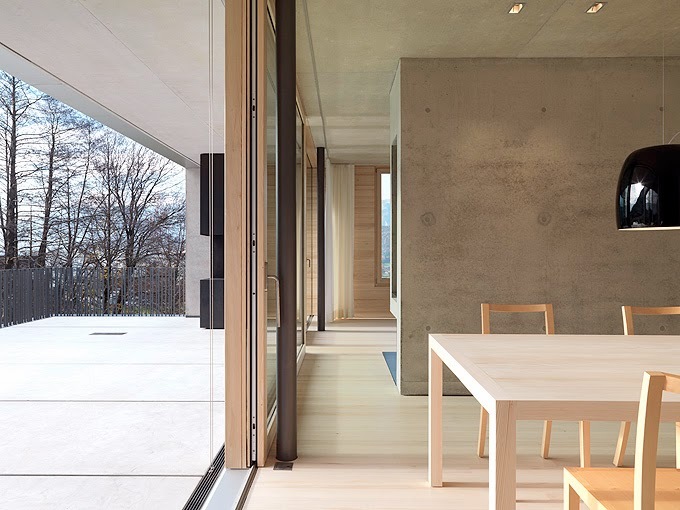 Two incisions divide the building, which sits prominently on a relatively level hill, guide guests to a small entrance niche and offer a view of the introverted courtyard to the north. 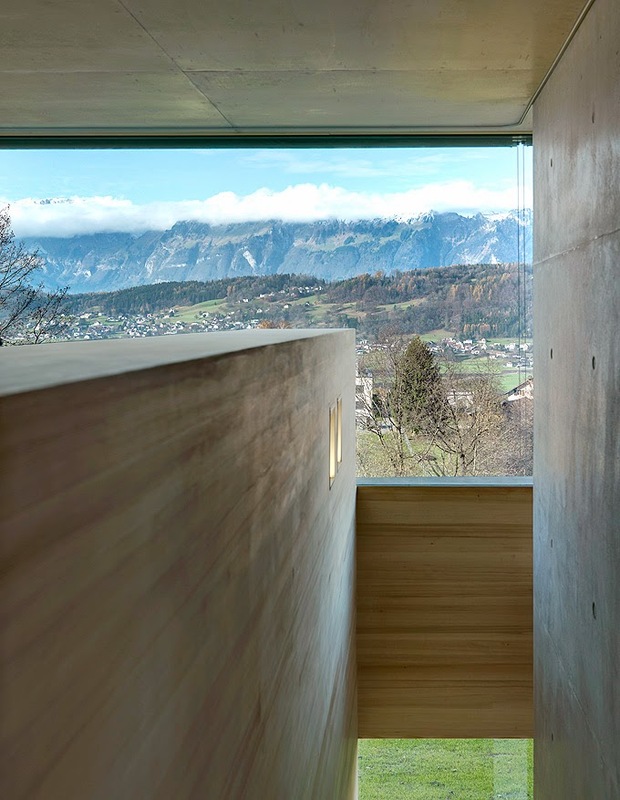 The hard shell opens up towards the valley and the south side, and the extensive glazing reveals the scenery and mountain panorama. 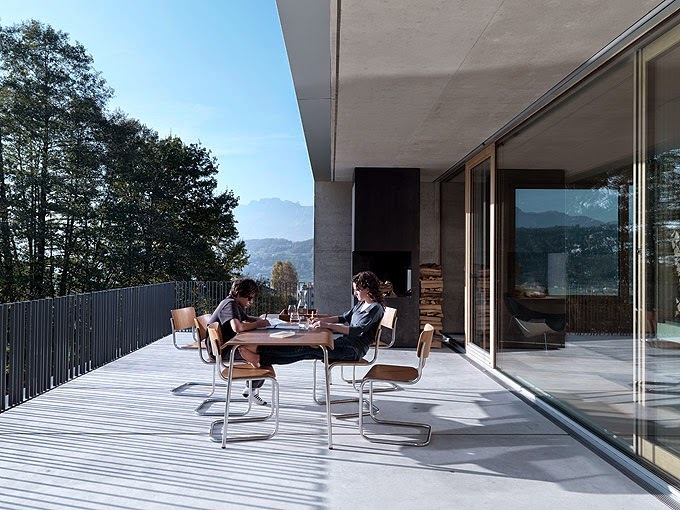 The terrace faces the pond and small integrated stream, which blend in with their natural surroundings, lends the courtyard a sense of an open air living room and connects the entrance floor to the grounds via a ramp. 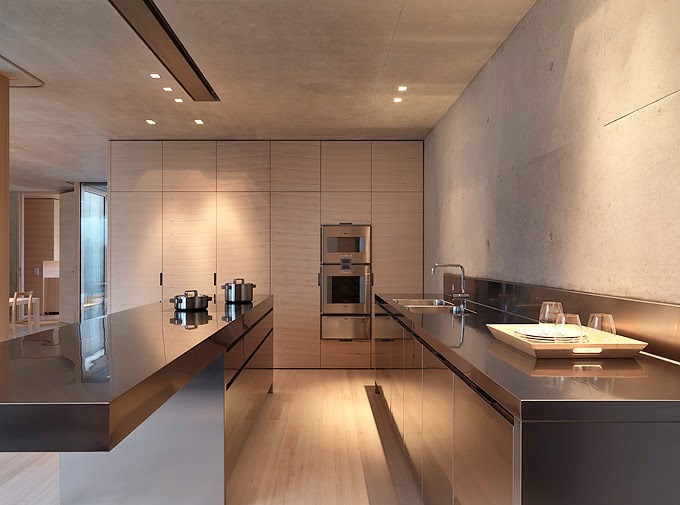 The main functional areas are arranged in flowing spatial transitions from the garage to the master bedroom, and from the studio style kitchen to the living/dining room. 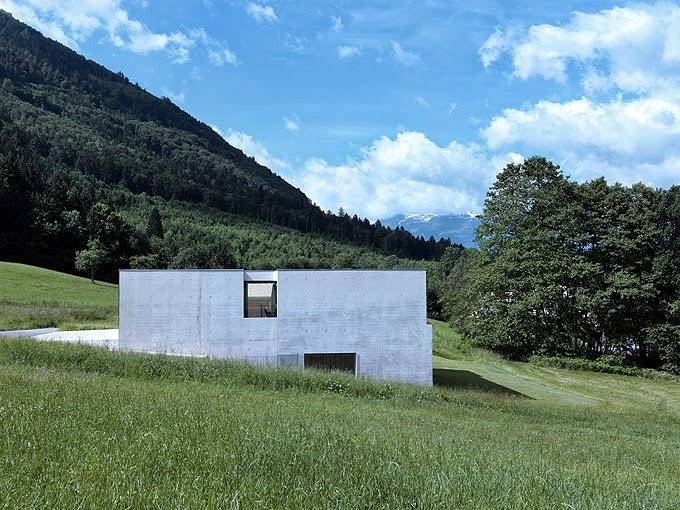 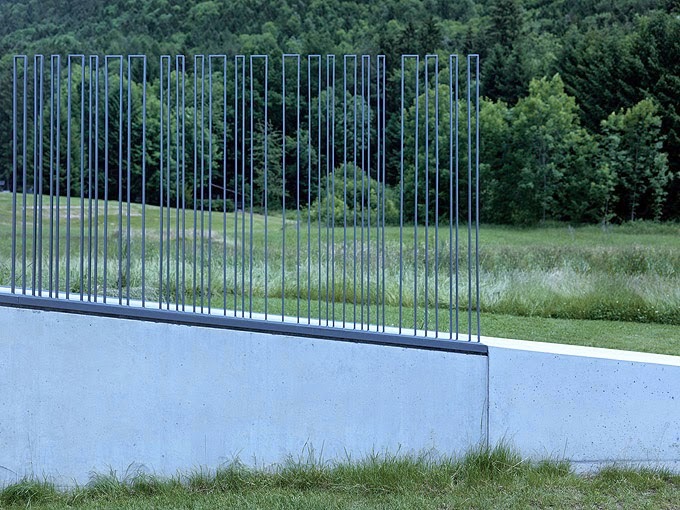 Due to the diagonals and axes, the visual relationships amaze and suggest size and expanse. 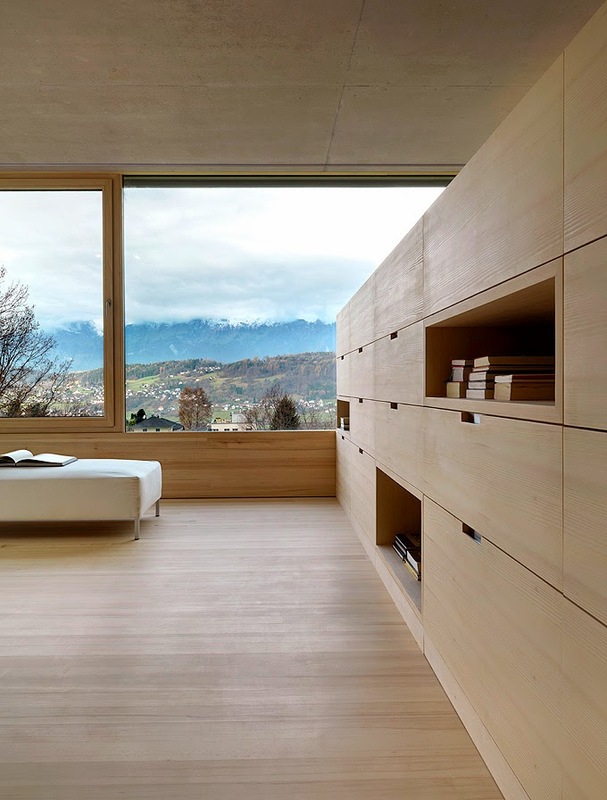 On the lower level, the rooms are compact and more defined. 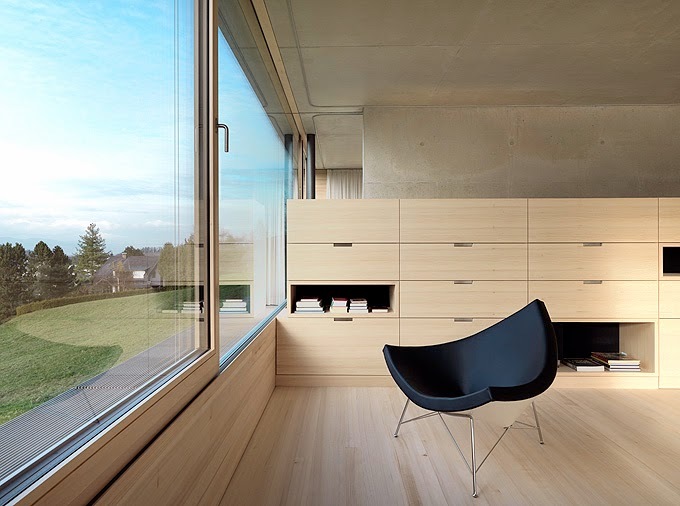 Children’s rooms, a study, a utility room, a bathroom, a sauna and a music room round off the range of rooms. 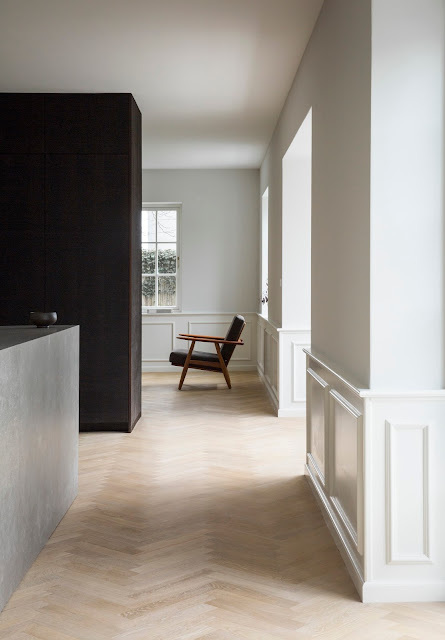 Materialisation and detail reveal elegant restraint. 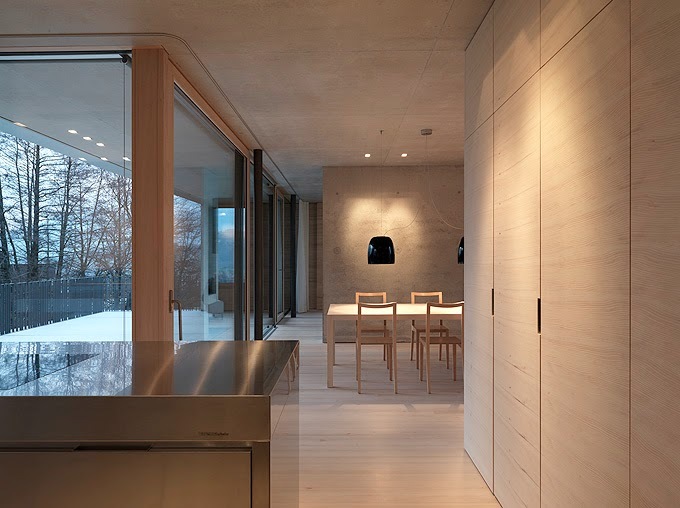 The smooth exposed concrete surfaces find their counterpart in the interior in the tactile and optical softness of the white pine floors, built-in furniture and walls. 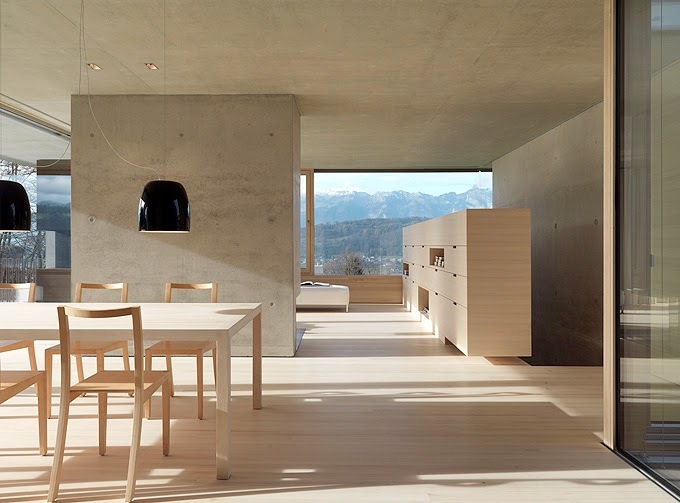 The character of the house turns out to be bright, inviting and almost homey. 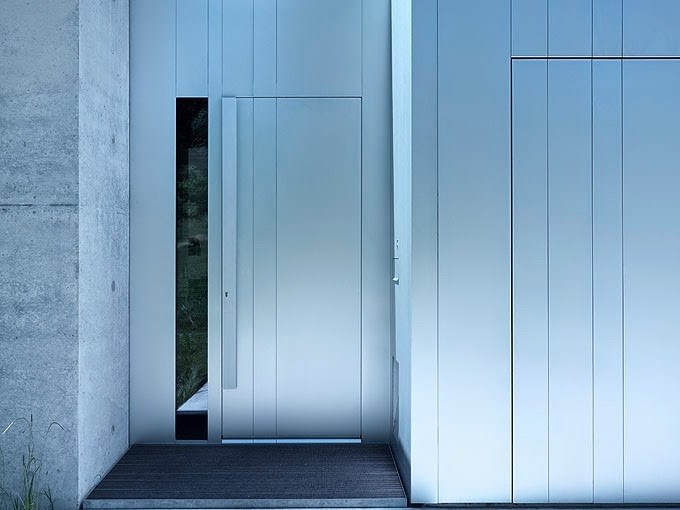 Windows and doors in white aluminium bring robustness into play and add to the powerful appearance of the concrete. 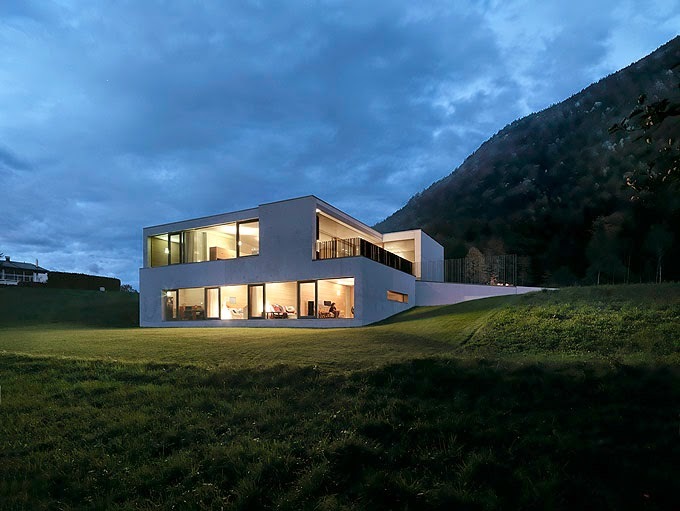 The structure with its notches and recesses sits on the hill like a meteor that has just landed. 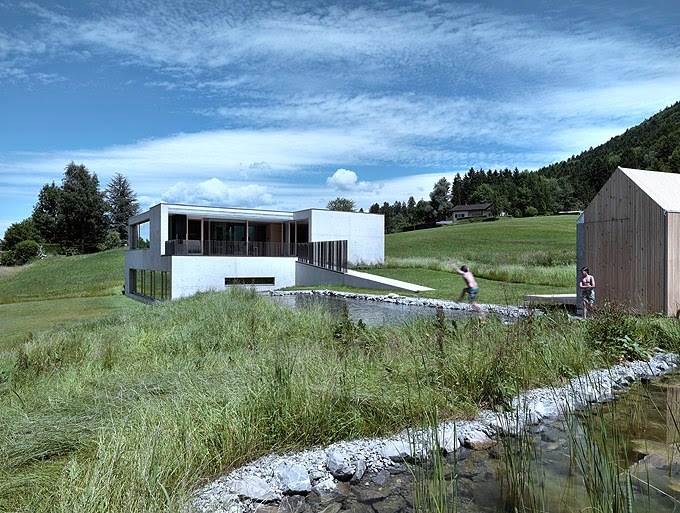 The adjacent litter meadow embraces the natural bathing pond and brings the cultivated green zone right up to the house. 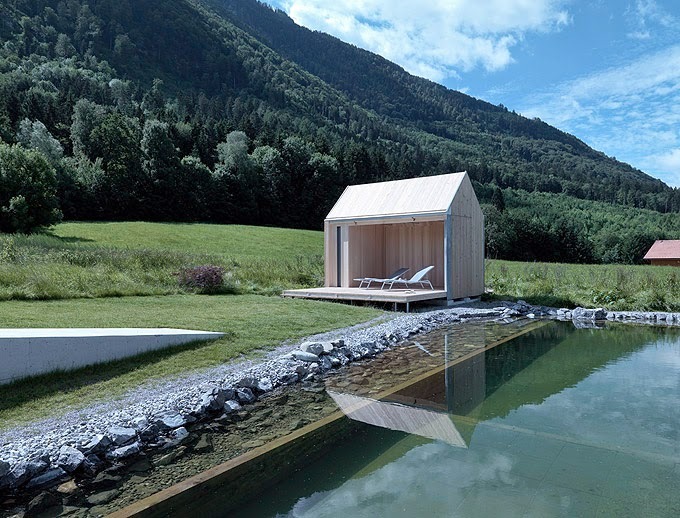 An unpretentious bathhouse built on the foundation of a small barn is an additional atmospheric and useful link to the surrounding agricultural land.